I first had this dish when I was 16, at the Planet Hollywood in Cannes, France. We (my cousin and I) were young and wanted to separate from our parents, and we thought Planet Hollywood was hip and cool. I still remember the taste of that penne. It was mind blowing; like fireworks going off in my mouth celebrating the distinct marriage of rich, velvety smooth cream with the juicy tomatoes brought elevated by the alcohol in the vodka. Upon my return home, I quickly attempted to re-create it. Back then I used a pre-made red sauce called Pomi. With time I’ve preferred the results when I go through the effort of making my own sauce from scratch. Although it will only take about 20 minutes of your time to make the tomato concasse at home, I realize that some just don’t have the time. In that case, make sure you select a fresh red sauce from your local grocer. They usually have them in the refrigerated section, with the fresh pasta. With regards to the origin of this dish; some say it originated in Bologna, Italy while others claim it originated back in the 80’s by a company wanting to market its vodka brand to Italians. I can’t help but think its nothing more than an American-Italian concoction. Any other thoughts? Place a deep pot on medium heat, fill it half-way with water, add a pinch of salt and bring to a boil. Once boiling, add the pasta, and cook according to packet instructions. I prefer my pasta al dente. Once the pasta has cooked, strain it immediately and toss it in a little bit of olive oil. Meanwhile, melt the butter in a sauté pan over medium heat and then add the shallots and dried oregano and sauté for 2-3 minutes or until the onions are soft and translucent. Add the garlic and sauté for a further 2 minutes then add the vodka and cook for 10 minutes to reduce it or flambé if you have done it before. Please be careful if you choose to flambé. Add the tomato concasse and tomato paste and cook for about 10 minutes or until it’s bubbling and has cooked through almost melting into a sauce. Stir often. Just before tossing in the pasta, add the creme fraiche and mix well to combine. Toss in the cooked pasta and mix well to coat then serve on individual serving plates topped with freshly grated parmesan and basil chiffonade. Can’t wait to prepare it! OMG that is brilliant! I have often been curious about this sauce and now that I see it I want it! Love the photos (especially the flambé!) as it helps so much! And very clever having the tomato concasse post as a teaser/lead in! This looks delish! 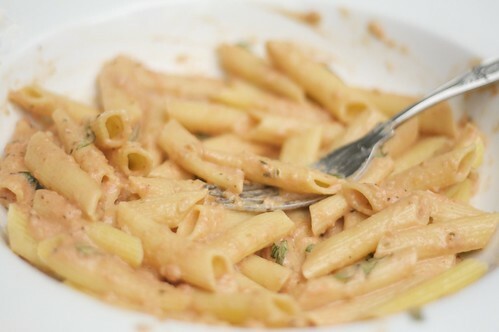 I’ve only had Penne ala Vodka in restaurants… I guess I’ll have to try it at home! looking forward to having you make this the next time I come around. I agree that such a recipe cannot come from a bottle, and there’s no need since seeing how straight forward this version is. Now I’m wondering what other types of alcohol would work in this preparation – must be time for a bit of experimentation! I’m surprised anyone would be inspired by Planet Hollywood food. I used to work there and as a foodie, I thought the fare was horrible. That said, there wasn’t anything in France I didn’t like so maybe the chefs threw the corporate cookbook out the window and made it with pizazz, because you are right, when penne al vodka is good, its great. Great idea – I don’t think the mention of chopping off your tongue just before you go into a recipe makes you anything like a food snob BTW! Urgh. This looks AMAZING! Can’t wait to try it — this weekend, perhaps? Lucas- i try to stay open-minded and take inspiration from everywhere, then adapt it to my taste. Jennifer- I’ve sent you an e-mail with the answer but to allow other less confusion. i measure everything using standard spoon and cup measurements. So yes I am sure it’s 1 Tablespoons. Photo’s are taken close up and usign macro lens. That looks fantastic. Am definitely adding this to my must try list. I’ve been cooking this dish for a long time. I learned the recipe from an italian chef in Jordan. My Penne Pollo alla Vodka Pomodoro, has chicken and mushroom with it and is very similar to this recipe. vodka can be substituted with white wine. May this bring you love,peace,respect and success. This looks great! 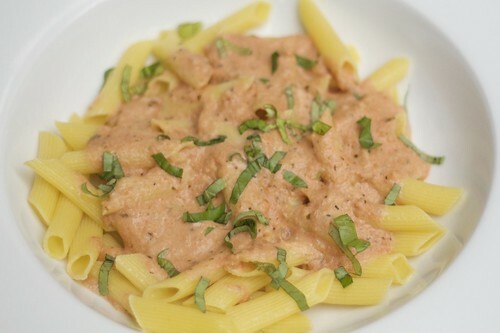 I wanted to do a salmon tagliatelle but now I’m thinking maybe the vodka sauce with salmon… Do you think it will work?